Andrew Ross ‘Stink Magnetic Studios, corner of Rutland Street and Drews Avenue 26/3/2009’, 2009. Silver gelatin contact print on gold toned printing out paper, 2010/5/5. Collection of the Sarjeant Gallery Te Whare O Rehua Whanganui. Tylee Residency exchange, 2010. 2016 is a special year for the Tylee Cottage artist-in-residence programme in that it has reached the significant milestone of being offered for thirty years and since that time over fifty artists have been in residence. Tylee Cottage was built in 1853 and is one of Whanganui’s oldest buildings. It was constructed for John Thomas Tylee, who headed the commissariat for the British troops which garrisoned the York and Rutland stockades. The Tylee family left Whanganui around 1865 to go to Napier where John Tylee later became Commissioner of Crown Lands. By 1985 the cottage had been moved to its current site on the corner of Bell Street and Cameron Terrace and had been restored by a group of volunteers who generously gave their time and skills, including well known historian, the late Norm Hubbard. 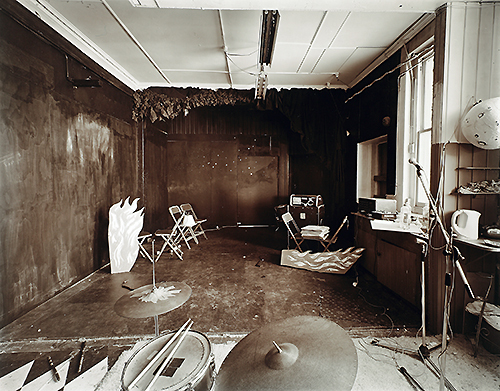 A proposal by former Gallery director, Bill Milbank to establish Tylee Cottage as a venue for a residency programme was accepted by the council who were responsible for the building and its maintenance. Milbank was also successful in securing ongoing financial support for the programme from the Arts Council of New Zealand which continued until 1994, at which time the stipend offered for the residency was then drawn from the Gallery’s operational budget. Photographer Laurence Aberhart was the first artist-in-residence and over his year-long residency produced a significant body of work that documented Whanganui’s rich architectural heritage. These images are just the beginning of the many fine works that have been produced in response to artists spending time in Whanganui. With over fifty artists having now participated in the programme, this current exhibition features work by a selection of artists who have made work as a result of their time in Whanganui that has a particular resonance with this place. Aside from allowing artists to have the time and space to be able to focus on their work, one of the main aims and expectations of the incumbent is that they produce work that connects with the city – its people, history and environs. Included are works that couldn’t have been made anywhere but Whanganui and all are from the Gallery’s permanent collection. Besides providing unique perspectives on this place, these works have all come into the Gallery’s collection as a result of the residency, as one of the key benefits of the programme is that the Gallery receives a work from the artist in exchange for the value of the stipend offered. This exhibition is a celebration of the programme and the critical role it has played in the Gallery’s exhibition programming and collection development over the last thirty years.